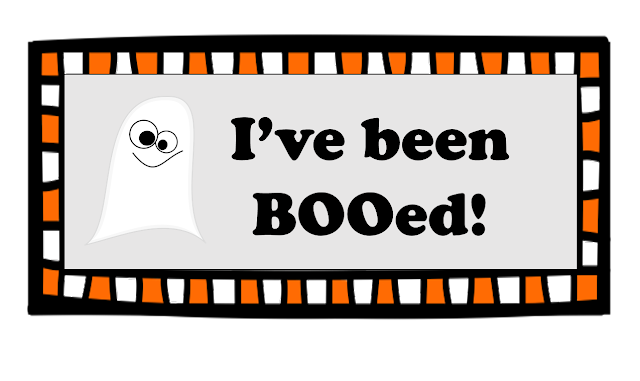 Yes, I have jumped on the BOOed Bandwagon. If you've been following my blog for a while, you will know that I really try to create a warm and caring environment--both for my students and our staff. I was at Target yesterday and found these cute You've Been Booed candy bars. I bought 4. One for each grade level (5,6,7,8) to start the boo rolling. I printed out the "I've Been BOOed!" door sign and attached it to the candy bar with a black ribbon. I then took the directions and the candy and placed it into four different mailboxes. The goal is to have teachers and staff members get a candy, hang the poster on their classroom door and then pay it forward by BOOing someone else. The ultimate goal is to have the whole school BOOed.